Raging Long Legs (ゾウノアシ?, lit. : "Elephant Feet") is a boss in Pikmin 2. It is related to the Beady Long Legs, but has bigger, hairier feet, a bigger body (to the point where any Pikmin can reach it), is glossy black with purple veins, and moves more slowly. It is also much stronger, and so takes longer to kill. Like the Beady Long Legs, the beast shakes Pikmin off and starts stomping angrily if enough damage is dealt to it that it becomes agitated; this is more dangerous due to the size of its feet. The fact that it has a larger body means any kind of Pikmin can be thrown onto it without waiting, which makes attacking easier. The size of its feet means they harm Pikmin and enemies alike. It dies in the same manner as the Beady Long Legs, ejecting its possessions from its body, crumbling into dust. If this creature does not have any treasure to drop, it will instead drop 30 Mitites. It can regain health if given the time. This rare boss is only seen on the last sublevel (15) of the Hole of Heroes, the single sublevel of the Cavernous Abyss in Challenge Mode, and in the Angle Maze stage of 2-Player Battle if the selected layout is the one with a large central area. Despite wielding feet much larger than the Beady Long Legs, this does not make it too much more of a threat. It is possible to stay underneath the creature's abdomen with a small squad of Pikmin without having to fear being crushed. This is because this enemy can't move its feet directly underneath its body, even when enraged, and so there is always a safe area right underneath the large orb. Since the Pikmin should be called back just before the enemy can shake them off, the amount of Pikmin that can be used are limited anyway, so a group of about 15 is recommended. Due to how quickly it regenerates health, it is impossible to make progress in damaging the creature if the player uses only one or two Pikmin. The Raging Long Legs is impossible to defeat with leaders. The Raging Long Legs is distinguished from the Beady Long Legs with the word "raging", which may have been given because it goes into a rage fit when it takes heavy damage. In Japan, it is called ゾウノアシ?, which literally translates to "Foot of Elephant". This is apt, given that its feet are quite massive. Its scientific name is Pseudoarachnia furiendis, where pseudoarachnia is a genus name used on the arachnorb family, and furiendis is similar to the Latin furor, which means rage, once again tying in to the creature's short temper. Internally, the boss is known as bigfoot, once more because of its large feet, but perhaps also as a nod to the legendary Bigfoot. Concept art of a Raging Long Legs. A Raging Long Legs as it appears in Challenge Mode. Raging Long Legs in Angle Maze, in 2-Player Battle. The boss on an unused cave (dam_cave_metal). The creature's e-card, #31 (17th yellow card). The Raging Long Legs has the most health out of all creatures in Pikmin 2, even more than the final boss. 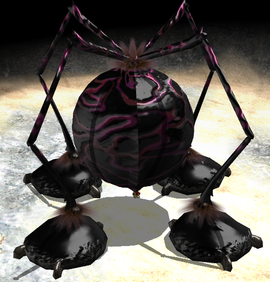 It can be implied that the Raging Long Legs is female, considering that Mitites are found inside of it subsequent times it is defeated – according to the Piklopedia entry for Mitites, they are parasitic creatures that spend their time inside the bodies of female hosts to lay their own eggs inside the host's ones. It is not yet known how Louie knows how to eat the Raging Long Legs as it disintegrates when defeated. This page was last edited on April 16, 2019, at 08:55.